Houthi terrorists carried out a drone attack on a high-profile military parade at a Yemeni air base, claiming the lives of at least seven soldiers with 11 others wounded. Amongst those killed in the strike was Intelligence Brigadier General Saleh Tamah. In comparison, an ISIS swarm drone attack against a Russian airbase in Syria last year was successfully deterred with the help of an advanced anti-drone system. The civil war in Yemen has the Iran-backed Houthis pitted against a Saudi-backed coalition trying to wrest the country from the militia. Iran has supplied the Houthis along with Hezbollah and Hamas with advanced drones based on American and Israeli models. As a part of the AVNON Group, we are a leading provider of turnkey solutions in the defense and HLS arenas, has developed an anti-drone system that can be deployed in sensitive locations such as military bases and airports. 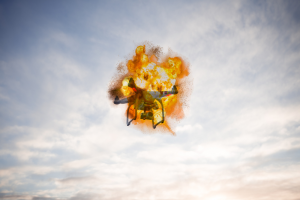 With terrorists increasingly looking to affordable, easy-to-use drones as a means of staging large-scale attacks, governments around the world need to stay a step ahead by developing new anti-drone technology. At SKYLOCK, we’re doing just that. Our innovative solution offers a multi-layered anti-drone shield. This is crucial for guaranteeing the security of critical infrastructure since advanced drones can fire missiles from a distance of up to 5km. Preventing enemy drones from getting within even a longer vicinity of key facilities is of the utmost necessity and SKYLOCK is one of the few anti-drone firms that offer this capability. In the off-chance that an enemy drone does penetrate this outer layer, SKYLCOCK offers a Passive Detection system which doesn’t interfere with the airport’s signals and preventing costly flight delays. The shutdowns of the UK’s two biggest airports over the past month alone have proven the necessity for an inclusive anti-drone system. SKYLOCK offers HLS agencies, police, and Special Forces units the means to protect critical national security assets.